The Rhyme Bible Storybook for Little Ones is a pretty good rhyming storybook. It gives a kid-friendly version of creation, the flood, Moses’ birth, David & Goliath, Jonah, Daniel in the lion’s den, Jesus’ birth, feeding the five thousand, Jesus on the cross, and the resurrection. They are all fairly familiar to children so that is a plus for this book. My primary concern with this is that in a couple of the stories, the rhyme is not very easy to follow. I view this as something my son could learn to read and rhyme with but could have difficulty on some of the sections. It doesn’t make the entire book bad, just a struggle through some of the sections. Overall, this is pretty good for what it is. It isn’t designed to get someone to Heaven, but might help someone learn a little bit about the One who can help us get there. There are hundreds of options for journals on the market. For one to stand out, it must be pretty unique. The Instant Happy Journal by Karen Salmansohn is just that. Where most journals just give you a paper to write on, she has given you a goal for each day to think about and write on. It is beautifully designed and bound and even has a page ribbon marker that looks like it will easily stand the test of time. Perhaps one of the highlights of this journal, whether by design or not, is that you do not have to go in order, page by page. There are no pre-printed dates on the pages, only a line next to the word “Date.” You can find the page that fits you mood for that day and stat writing. Some of the thoughts to get you writing are: “Fall in love with being good to yourself. How might you be good-er to you?” and “What are you angry about right now? Let it out!” These along with 363 other starters will surely get you writing something each day. If you like to journal or have always wanted to start one, but didn’t know how or what to write, check out the Instant Happy Journal for "365 days of inspiration, gratitude, and joy." It seems that every time you turn around someone else is starting their own photography business. They’ve bought a fancy new camera and have mastered the “auto” function. These people have spent hundreds of dollars on a camera and will never learn to use any of the awesome features their camera has. That is what makes you different. You want to learn. You want to know everything that your camera can do. For you, John Shaw’s Guide to Digital Nature Photography is a must have. First, don’t let the title of this one turn you off. The information in this book will be very beneficial to you no matter what type of photography you are involved in. He covers basics such as aperture, shutter speed, and ISO. That section alone is worth whatever you give for this book. Next, this book is valuable because of his discussion on gear. If you are starting out in photography and want to be successful, wether as a hobby or business, you will need certain gear. It can be overwhelming to decide exactly what it is that you need. Let John Shaw give you some pointers. Finally, one of the things I love most about this book is the photography displayed within. He tells you every bit of info about that picture so you can recreate something similar if given the opportunity. There are beautiful pictures on every page of this book. Set it on your coffee table and let others enjoy them. The bottom line is, if you want to take your photography to the next level, I recommend that you get this book. Especially if you are working on nature photography. Don’t just point and shoot. Learn how to let your camera take your pictures for you. I received this book for free in exchange for this review. I received a free copy of this book in exchange for this review. There are many people who give advice on leadership. Only a few of them truly have good advice. John C. Maxwell is one of the few. 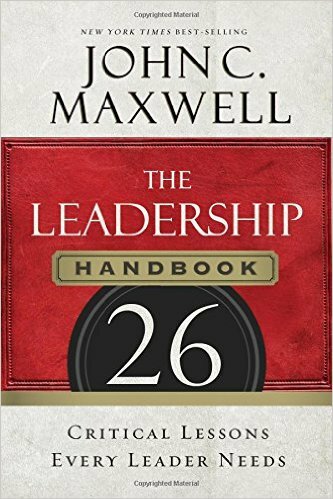 In The Leadership Handbook: 26 Critical Lessons Every Leader Needs Maxwell gives some great advice for anyone in any sort of leadership position. Each chapter, which is made up of one of the 26 lessons, ends with exercises to help get these ideas rolling in your own life. One of my favorite chapters is #20 - "The Choices You Make, Make You." He gives three choices that he has made that govern how he leads. One of these choices is "Helping people is more important than making them happy." This one line makes the entire book worthwhile. If you are involved in leadership in any way, you need this book in your library. It is one that I will not be getting rid of any time soon. Go and get your copy now. I received a free copy of this book from BookLook Bloggers in exchange for this review. Have you ever read the ingredients list on a product and wondered what all of that stuff in your Slim Jim was? Seriously, what is mechanically separated chicken and lactic acid starter culture? Patrick Di Justo answers that question and many more in this book. He gives us 26 items that we might eat and 24 that we hopefully would not eat and breaks down many of their ingredients. 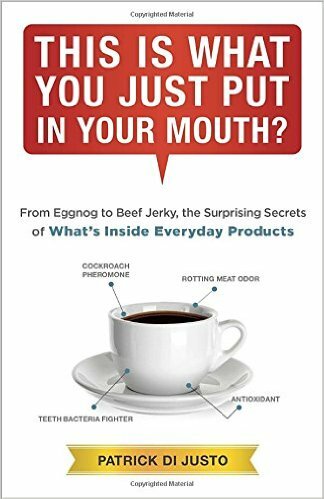 This is not a book that you would buy if you were looking for a life changer (although it might make you never want to eat a Slim Jim ever again), but it is fairly interesting and would be great for illustrations. My favorite part of the book is the 2nd section. After discussing the strange ingredients in the food items, he moves to some items that are not edible. It is interesting to see what makes Fix-A-Flat work and what all is in that flu shot you got a few months ago. He also gives a few stories to go along with his explanation of the products. Overall, it is worth looking at this book. I wouldn't buy it, but if you see it at the library or on the shelf at the book store, sit and read a little. You may never look at some products the same again. This is a daily devotional book designed for teens but it is not the ordinary daily devotional. Each day presents the reader with a verse or short section of scripture with some sort of activity to get them involved in thinking about the verse deeper. Most are very simple (draw a picture related to the verse, listing certain things, even doodling) and each day's activity can be completed in only a few minutes. It is great in its simplicity. For someone who is looking for a simple daily thought this would be good. If you were looking for a deeper study, this is not the place to start. It would be appropriate for a young teen or preteen and older teenagers might find it to be a little strange or goofy. Overall, it is probably worth picking up for a younger child if they are looking for a simple devotional book. It may even be good for you to go through it with your child to introduce a little more discussion that the book is lacking. I received a free copy of Dare U 2 Open This Book from BookLook Bloggers in exchange for this review. I have been a fan of the Sticky Faith series for a few years. Since a friend first told me to check out the original book, I have kept up with each additional book in this series. This family edition is just as great as the others. If you are not familiar with Sticky Faith, you should be. If you are involved in the lives of young people in any way and want to see them stay active in the church, you should become friends with Sticky Faith. This edition is focused on families and does a great job giving families tips and ideas to help them grow stronger in their faith together. You’ve probably heard that a family that prays together stays together. That is true and this book will help you to do that and so much more. Each chapter give ideas that a family can do and also examples from other families that have been doing great things. As a warning, it can be a little overwhelming to read all of these ideas from other families and begin to feel bad. What we must remember is that all of these are from different families. No family is perfect, but some have done some really great things and given some really great ideas. Why not learn from them. Get this for your family and set a goal of a certain number of things you want to see implemented into your families lifestyle. As you go through the book, write down the things you can be doing and start doing them. There are a ton of great ideas to help your family develop a faith that will last. If you like to make your brain hurt, then Bend Your Brain is for you! The puzzles in this book are designed to work on different areas of your brain and to help with problem solving, memory, and to reduce stress (Although working on some of the puzzles might add to your stress level). Many of these puzzles will take a while to solve. You will find yourself looking and re-looking at them numerous times to see if you might have missed something. They are all solvable, but most will take a while and they range from fairly easy to crazy. This is a fun book if you like to challenge your brain or your friends. Give it a try and see how many you can solve. Click the link below to read more about Bend Your Brain or to purchase it.